Cranbourne Golf Club was formed in 1951, following discriminatory practices against minority groups by a significant number of Victorian Golf Clubs. The prime mover in the formation of the Country Club was Sydney Kaufman, who called a meeting of his Jewish friends on June 14, 1951. Some 20 people attended. A provisional committee with Syd Kaufman as President, Harold Lasky as Vice-President and David Morley as Treasurer was elected and the search for suitable land to construct a golf course commenced. Because of the rapid expansion of housing estates in the Dandenong area, the search was concentrated in the Cranbourne district. 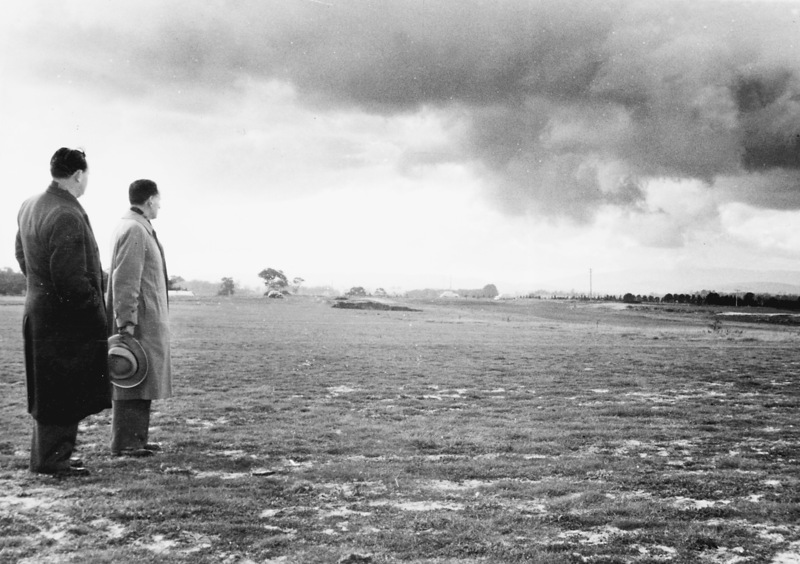 Assisted by Sam Berriman, Curator of Huntingdale Golf Club and a noted golf course architect, the present site was chosen and purchased as suitable for a championship golf course. The course took over two years to construct and was officially opened by Syd Kaufman on April 9, 1954. Sam Berriman’s lay-out measured 6,304 metres and provided for 87 bunkers. The course was not completed precisely to Berriman’s design and at the commencement of play measured 6,330 metres with 71 bunkers constructed. Cranbourne Golf Club was formed on May 4, 1953 and assumed responsibility for maintenance and the completion of construction. The first elected executive was Syd Kaufman – President, Harold Lasky – Vice-President, Harry Cohen – Captain, David Morley – Treasurer and Barnet Cohen – Secretary. Gordon Black was curator for more than 20 years. Under his supervision thousands of trees were planted, to change the face of what previously was barren market garden land. These trees now provide outstanding character, as well as both golfing difficulty and enjoyment. Through the 80’s, 90’s, and over the past decade, the Club has established a Championship Golf Course that has hosted lucrative Pro-Am events, as well successive Victorian Open’s in 2000 and 2001. The Club has often been described as a “Hidden Jewel”. Through maintaining a financially sound Club, and adopting best practice in turf maintenance, the Club now sits proudly amongst Melbourne’s Premier golfing facilities. ‘Whats Golf?’ by Les Kausman The first 50 years of the Cranbourne Golf Club ‘What’s Golf?’ traces the history of the Cranbourne Golf Club from the time it was formed and opened for play in 1954, until its 50th anniversary in the year 2004. The author is Honorary member, Les Kausman, a Cranbourne member since 1980 and president of the Club from 1985 to 1993. The Foreword is by Peter Thomson, who describes ‘What’s Golf?’ as a well-presented story and well written a valuable piece of golf history.’ The book is more than a walk through a golf club. It is a walk through 50 years of world history as it relates to this particular Club. An examination of society is integral to this history, because an aberration of society thrust the Club into existence. “What’s Golf?” is easy to read. The important historical progress of the Club is interspersed with interesting and sometimes amusing stories of the people and events that have fashioned the Club in the 50 years since 1953. “What’s Golf?” is available from the office and provided to all new members of Cranbourne Golf Club.